Mike Renner is fighting for Becca Kufrin's heart on The Bachelorette this season. Mike is a 27-year-old sports analyst from Cincinnati, OH, who introduced himself to America when The Bachelorette's fourteenth season premiered May 28 on ABC. Becca probably remembered Mike on Night 1 for his long blonde hair, but he also memorably brought a lifesize cardboard cutout of Arie Luyendyk Jr. with him. Mike hasn't received a lot of screentime so far, but that will probably change in the near future. 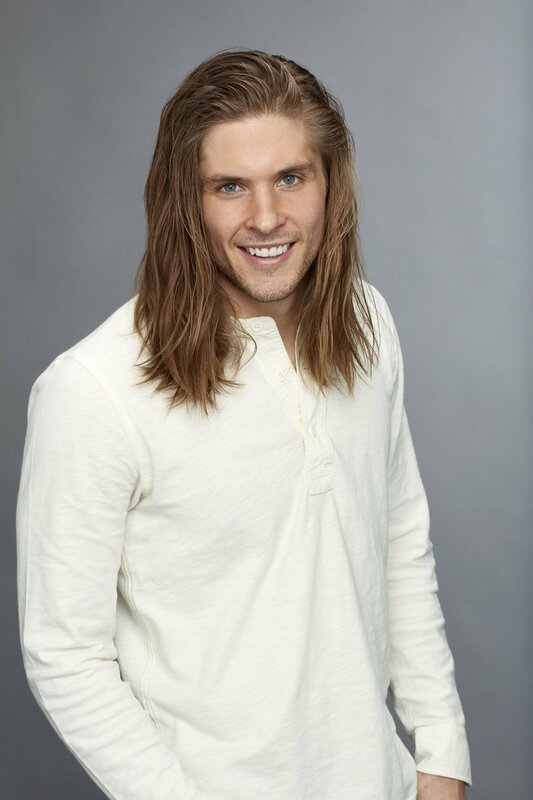 Until Bachelor Nation sees more of him, let's learn more about this handsome guy with a sense of humor. - Both of Mike's two front teeth are fake. When he was 10-years-old, he jumped onto a moving treadmill. It took him 15 years to get over the fear of running on a treadmill. - Mike has a beloved dog, a bulldog named Riggins. - Mike graduated from Notre Dame, where he majored in Accounting and Computer Applications. - The bachelor loves festivals, horse races and state fairs. - Christon Staples isn't the only suitor on The Bachelorette who can dunk a basketball on the court! Mike has some height on him, and he can also dunk. - Mike currently works as a football analyst for Pro Football Focus.